Christopher Smith, the director behind Severance and Triangle, is the unlikely source of Get Santa, a fairly satisfying, if unremarkable, festive fable. Fresh out of prison, Steve (Rafe Spall) attempts to put his shady past behind him and reconnect with his son. 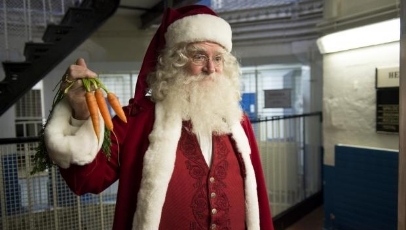 But when Santa (Jim Broadbent) turns unexpectedly asking for help, Steve finds himself back on the run, in a desperate bid to save Christmas. Upped to no end by its keen cast (Broadbent provides an excellent Santa, and is ably supported by Spall and the ever-reliable Jodie Whittaker), Get Santa prevails by the skin of its teeth. The script, though straightforward, has a habit of overburdening itself and it’s rather dry, with only one or two humorous scenes. But it’s trim enough (the whole thing clocks in at 102 minutes) and Smith manages to merge light with dark well enough to pepper the film with enough mettle to keep it alive. There’s nothing new to Get Santa, and Smith shouldn’t make a habit of watering down his sensibilities to appeal to a wider audience, but it’s competent and fun enough.